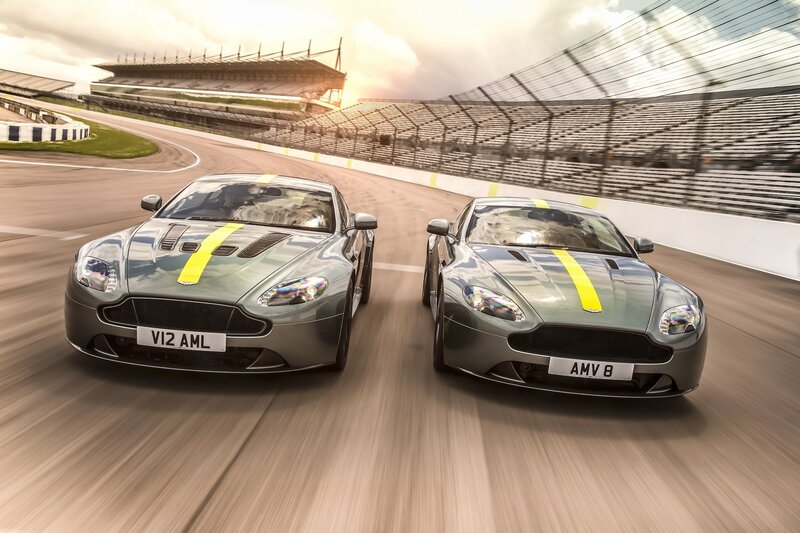 To put it in a nutshell, Aston Martin‘s Vantage, its most successful sports and extreme performance car since the 1950s, is the carmaker’ first AMR model to enter production. Launched at the Geneva Motor Show earlier this year, the new line stays true to the brand’s passion in designing cars with sleek looks to match their vivid performance and vibrant character. The Vantage AMRs are offered with 430bhp V8 or 595bh V12 powertrain options, with both models available in Coupe and Roadster body styles in selected markets. Both engines are fitted with automated sequential manual paddle-shift transmissions, or for stickler drives, six and seven-speed manual gearboxes in the V8 and V12 Vantage AMRs respectively. AMR is available in four striking AMR exterior schemes: Stratus White with an orange graphic; Ultramarine Black with blue graphic; Zaffre Blue with red graphic and Scintilla Silver with grey graphic. The AMR and ‘Halo Pack’ take inspiration or direct influence from Aston Martin Racing’s participation in the FIA World Endurance Championship, working a combination of Stirling Green paint and vivid Lime Green accents for dramatic effect. As a finishing touch, a special Union Jack-enameled AML wings badge, previously featured on last year’s GTE racer, is available as a no-cost option. 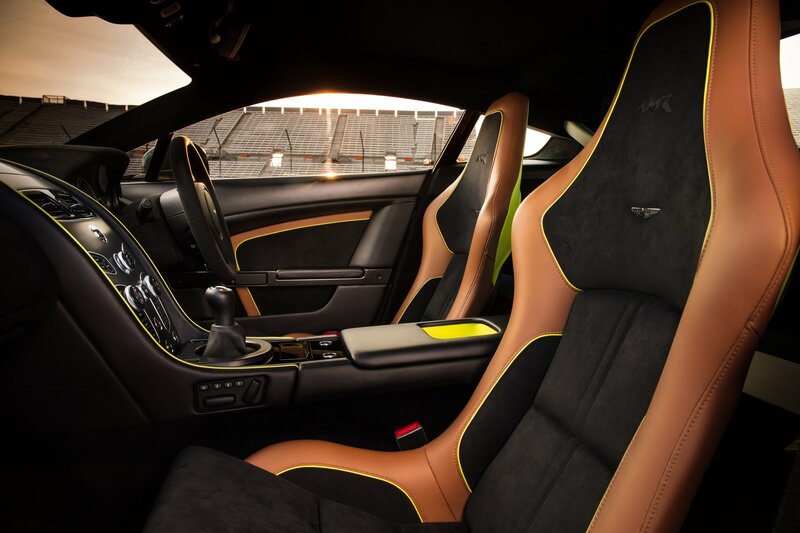 Each of the exterior schemes is matched to a different interior scheme that demonstrate Aston Martin’s mastery of materials and hand-craftsmanship to perfection. With a combination of leather and Alcantara for the Coupes and all-leather for the Roadsters, each interior scheme has been carefully chosen to compliment the exterior colors. The extensive suite of carbon fibre features includes lightweight carbon fibre seats, a lightweight front grille, side strakes, lamp infills and mirror caps on the outside, instrument surround, door tops and door grabs on the inside. 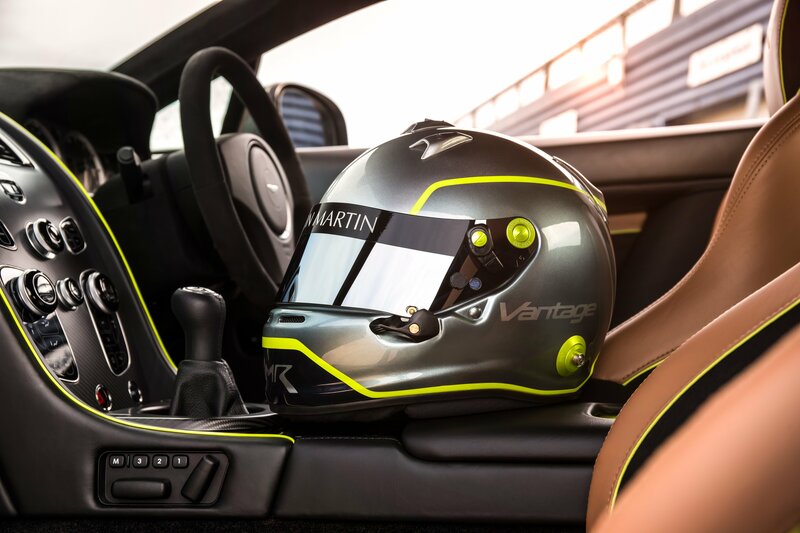 For adepts of customization, the Vantage AMR offers additional options from the new AMR Accessories range. The most dramatic of these is the AMR Aero Kit, produced in partnership with Aston Martin Racing. The extensive aerodynamic package for coupe models is constructed from carbon fibre and features front splitter and dive planes, plus side sills and a fixed rear spoiler. Another highlight is the optional forged aluminium AMR Vantage wheel, which mimics the design of the wheels fitted to the Vantage AMR Pro Concept shown at Geneva. 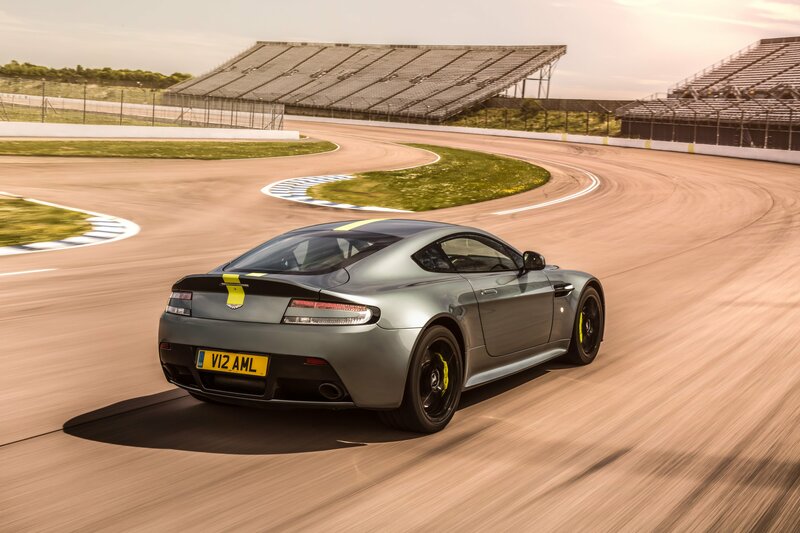 Further weight savings can be made with the AMR titanium exhaust, which saves 14kg over the standard V12 Vantage system, sounds sensational and helps to sharpen engine response. The AMR is unmistakably a Vantage. Aston Martin enthusiasts will undoubtedly love it, especially for its motorsport pedigree, dynamic looks and emotional qualities. Limited production numbers will render the new cars extremely collectible!